I decided this season is all about making healthier choices. I re-joined my gym, after a year’s lapse, and I also started subscribing to a weekly fruit delivery service. I always thought I was one of those people who always bought fruit on a regular basis, but in reality that habit falls to the wayside when work gets busy. In Taipei, people buy usually buy fruit in three ways: at the traditional market, where fruit is sold by the kilogram, or at the supermarket, where fruit is prepackaged and priced, or at convenience stores, where fruit is sold pre-cut, in plastic containers. In an ideal world, I would like to tell you that I buy fruit at the fruit stands, but in reality they are long closed for the day by the time I get off from work. I’m usually stuck with the latter two options. Then, I find myself buying the same fruits over and over again, week after week. So when my friend Peggy started using the fruit subscription service Fruit Pay, I decided to try it too. I’ll first go over the ordering process, then I’ll show you the fruit that I’ve received so far. Then, I’ll tell you which ones were my favorites, and which ones I didn’t end up liking. Lastly, I’ll make some comments about what I think about the services provided. 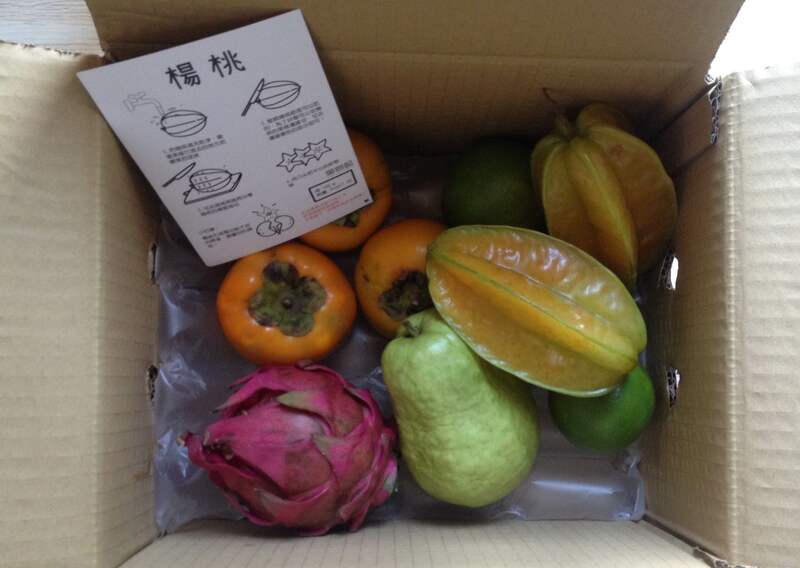 FruitPay receives fruits from small farmers from all over Taiwan. Then the fruit is packaged according to customer preferences and then sent by courier to your front door. The ordering process is very straightforward. Unfortunately, their site is in Chinese only, and so far, they only accept credit cards with a Taiwanese billing address. But I’ve tried to explain the process below, so you can get a feel for how their system works. As part of the plan, you can choose up to 10 fruits that you don’t like, and they won’t be sent to you. For the first few weeks, I thought I would keep an open mind and see what was sent to me, before opting out of any particular fruits. Logistics aside, now onto the fun part! The following photos are of the boxes I received for the first month or so, into my subscription. These boxes are part of the 1 person, eating fruit every day. I pay $499 TWD per box, and my credit card is charged once a month. Each following photo is labeled with the week number, and the types of fruit received. Week 4’s box was delayed for a few days by another typhoon, this time named Megi. I’m guessing that a lot of the local fruit harvests continue to be affected by the typhoons, which is why the kiwis from New Zealand are here again. Sometimes the fruit comes with handy little informational postcards, that teach you how to cut and serve the more unusual types of fruits. Week 6 came with a card about starfruit. The bags also have holes punched in so some of the moisture from the fruit can escape. Each type of fruit comes labeled, which details the fruit name, where it was grown, the grower, the grower’s contact details, the serving method, and how it should be stored, and when it should be eaten. So far, my favorites are the passionfruit, which have such an alluring aroma, that you can smell before you even open the box. I love them on top of a bowl of yogurt, and a squirt of honey. 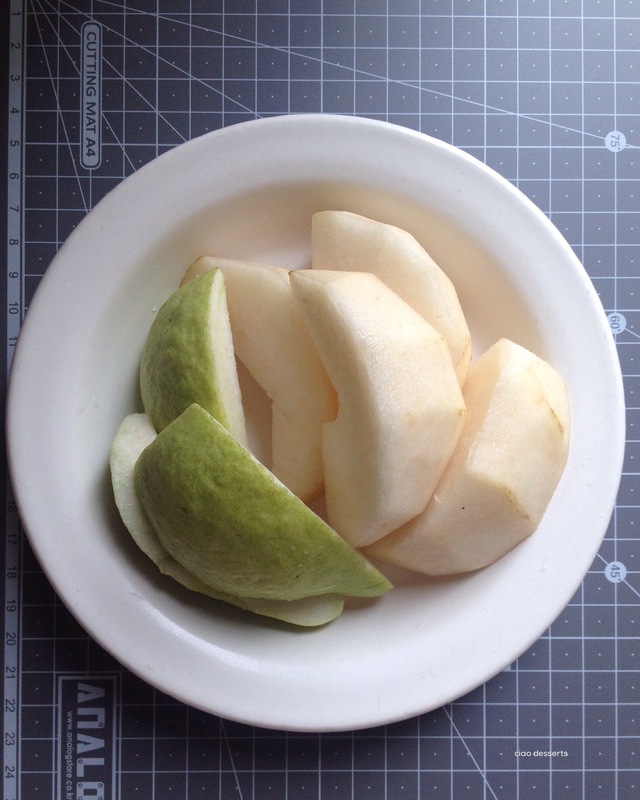 Other fruits that I’m always happy to see are guavas, and Asian pears. I usually slice them up as soon as I receive them, and portion them out into containers, so I can take them to work to have as a snack. Perhaps my most favorite fruit that I have received so far are the “long-yan,” otherwise known as dragon eyes. They were plump, juicy and very sweet. This is a type of fruit I never buy for myself, because I’m usually too impatient to peel them. 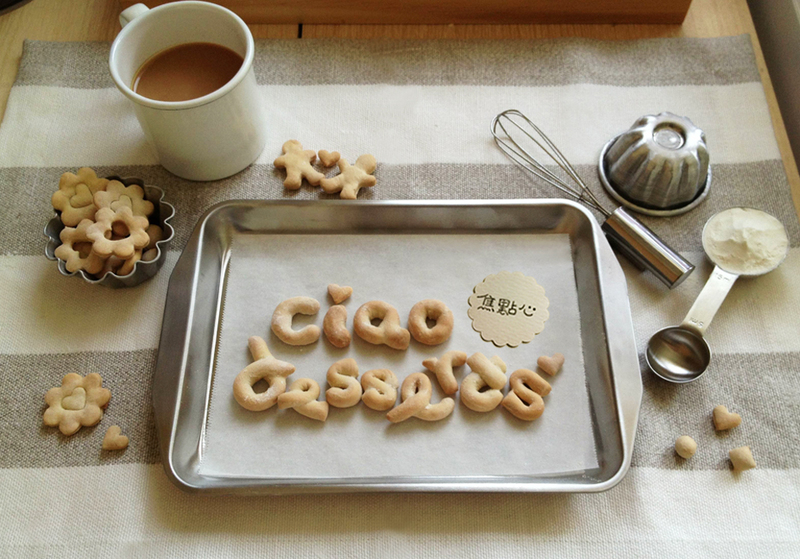 But they were definitely worth the effort! Another fruit that I enjoy, but never buy for myself is melon. I never know how to choose one, and whether I’m getting a great one, or a dud. It’s nice to have all that guesswork taken out, and just be presented with a perfectly sweet melon. I divided this melon into two portions, one for breakfast, paired with a ham, egg, cheese toastie, and the other half as an afternoon snack. 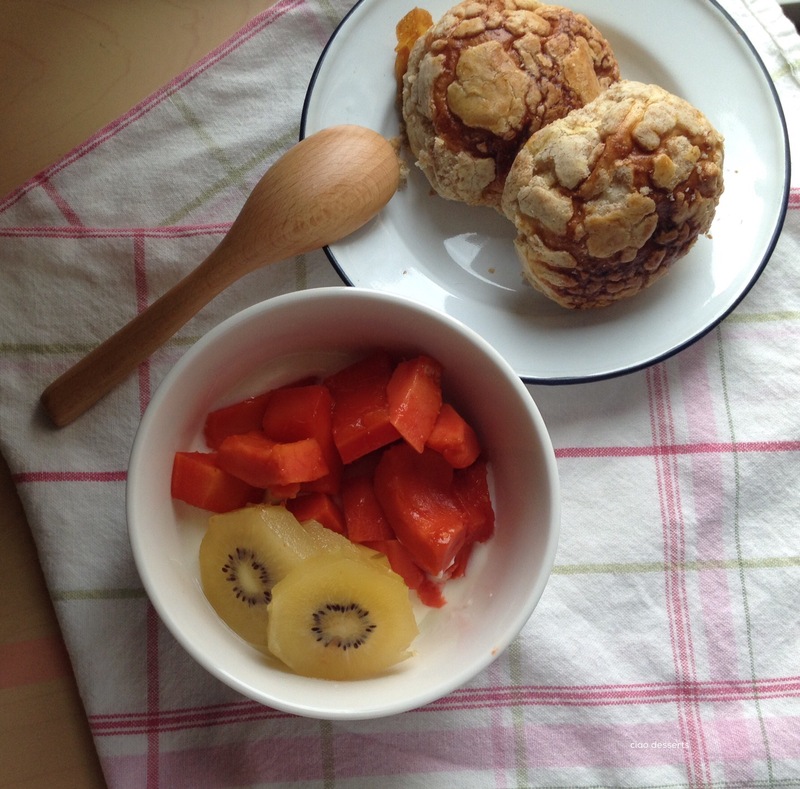 My breakfasts are a lot more interesting with all this fruit I have on hand! I keep it simple and slice them ahead of time, and I eat them on their own, or over yogurt. During this past month or so, I also discovered that there was some fruit that I didn’t like. I wasn’t especially fond of the local grapefruit (kind of tasted like a very tough orange) and I wasn’t too excited to receive the imported kiwis or oranges either. The fruit that I was most surprised by were these “tree tomatoes,” which I had never encountered before. I looked these up online, and it turns out in English, they are actually called “tomatillos.” I ate the first few, thinking they were different, but not entire sold on the flavor. The flavor was a combination between guava, passionfruit and tomato. They had kind of a flat, sweet taste. Then a few weeks later, I got a box with a huge bag of them. After finishing them, I finally came to the conclusion that I didn’t care for them, at all. In retrospect, I was surprised to find out that I am a bit pickier about fruit than I expected! I just have to be upfront, honest and clear (with myself, and the service) about what I like and don’t like. That way I’m happy every time I open up a box. I think I’ve had a good experience with their service so far. I receive a text message the day before the box is delivered, to remind me to pick it up at my building’s front desk. Once I’ve worked out what fruits that I didn’t like, I found the service to be really responsive, and the variety of fruit has been adjusted accordingly. I’ve been asked quite often, “do you really eat that much fruit every week?” The answer is, yes! It’s surprising how fast the fruit goes. What works especially well for me is if I cut and portion the fruit as soon as the box arrives in my building on Wednesdays. Some boxes I eat at home, others I bring to work with me. The important part is that I plan ahead and prepare the fruit so it’s as easy to eat as possible. Any fruit that is not eaten by Tuesday, I just either make into juice or a smoothie. I’m also much more conscious about not wasting the fruit, because I knew one specific person worked hard to grow it, and it took quite a lot of effort to arrive in my home. Note that their website is only in Chinese, so you might have to grab a friend who reads Chinese to help you. They also currently only accept credit cards that have a billing address located in Taiwan. Please note: This was not a sponsored post. All the items were paid for with my own money, and opinions and experiences described are my own. 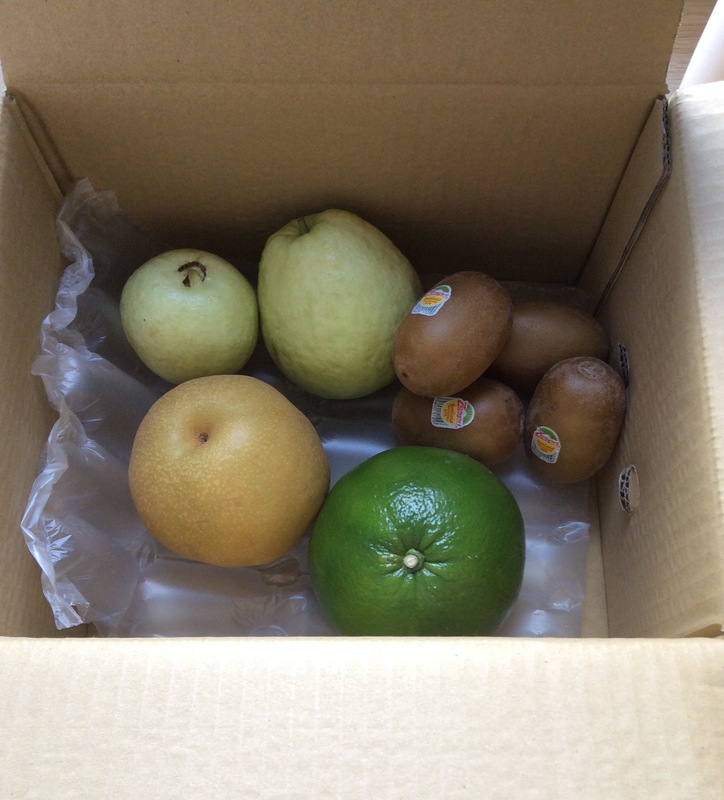 This entry was posted in Uncategorized and tagged fruit pay, passionfruit, subscription box, Taiwan fruit. Bookmark the permalink. wow, i’m so envious of all the tropical fruit you get delivered to your place! to be fair, living in california, i’m sure i can find most of what you’re getting; i’m just too lazy to scope out all the ethnic supermarkets that would likely stock them. i’m a lot like you, i tend to buy the same kind of fruit every week, which for me are berries because they require no prep besides a quick rinse.